I was browsing a bit on Stumbler tonight and saw a site that listed a bunch of interesting places to visit to learn things. It got me to thinking that it would be neat to collect some different sites on specific topics and share them with you. First up, learning a foreign language. Some of these sites were new to me, others I’ve heard of before. Duolingo. Learn a language for free. Forever. Look at all the languages you can learn! I’ve used this site to learn a smattering of Portuguese, German and Dutch. Lang-8. Let our community of native speakers support your language learning. A new language learning platform where native speakers correct what you write. With native speakers from more than 190 countries and 90 languages to study, finding a language partner has never been so easy. HelloLinga. Harness the power of social networking and the endless resources of the web… Discover and share the best resources. Connect with learners, practise with speakers. Busuu. Learn to build sentences with advanced grammar units. Take level tests and earn official McGraw-Hill level completion certificates. Make sure you never forget the words you’ve learned. Download all lessons for unlimited use, anywhere, anytime. Practise your spoken conversational skills with native speakers. Yojik. This site is dedicated to language learners. You will find here the FSI, DLI and Peace-Corps courses. Memrise. 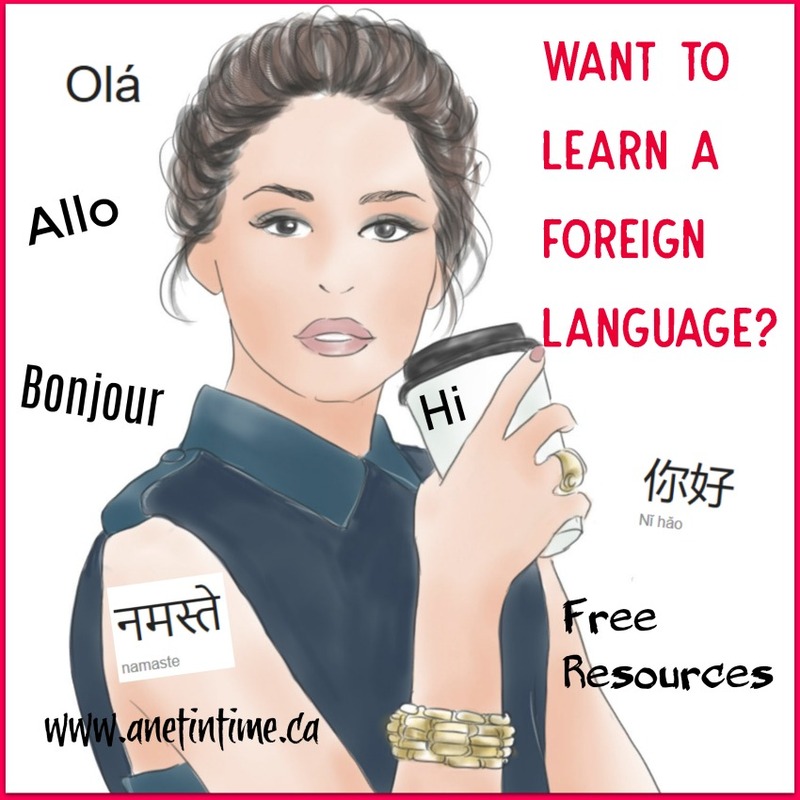 a free and pro subscription for learning a variety of languages. BBC Languages. 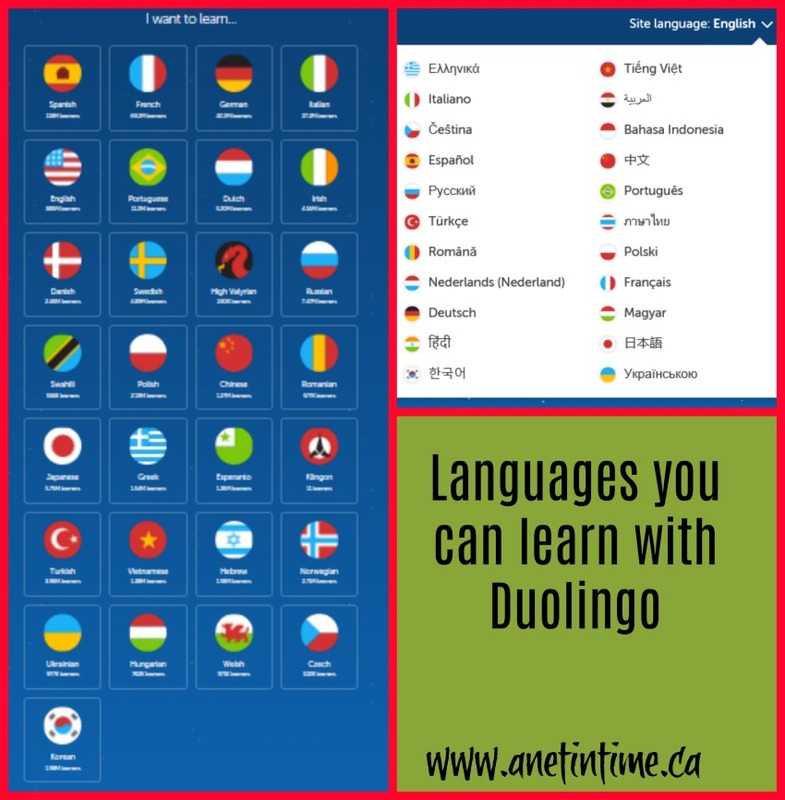 40 languages to learn. This site isn’t currently updated but still works. NativLang. You can learn Portuguese, Icelandic, Aramaic, Italian, German, Middle English, Spanish, Modern Greek, Ancient and Koine Greek, Sardinian. Has a youtube channel as well. StudyShack. Using flashcards to help teach languages. So there you have it, 11 free websites to learn a least a smattering in a variety of languages. Enough to give you a good head start and see if you enjoy learning a certain language. I know from browsing you-tube there are a variety of videos there as well. It’s always a good thing to see if the language you want to learn is doable before investing money into it eh? 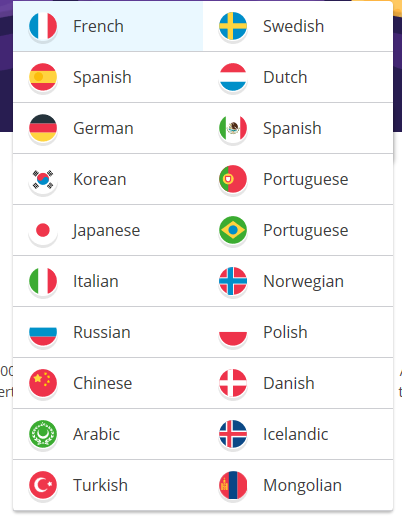 If you are a member of SchoolhouseTeachers.com, there are foreign language option there as well. They have latin, greek, latvian, french, spanish and more. Right now you can do a bundle deal see details below. 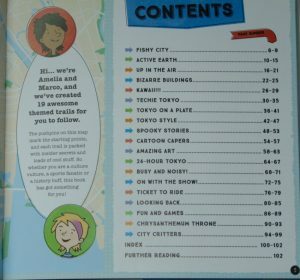 City Trails is a series of books from Lonely Planet Kids that leads the reader through different cities around the world. Today we are looking at Tokyo. In it we will learn the secrets, stories and other cool stuff found in this magnificent city. 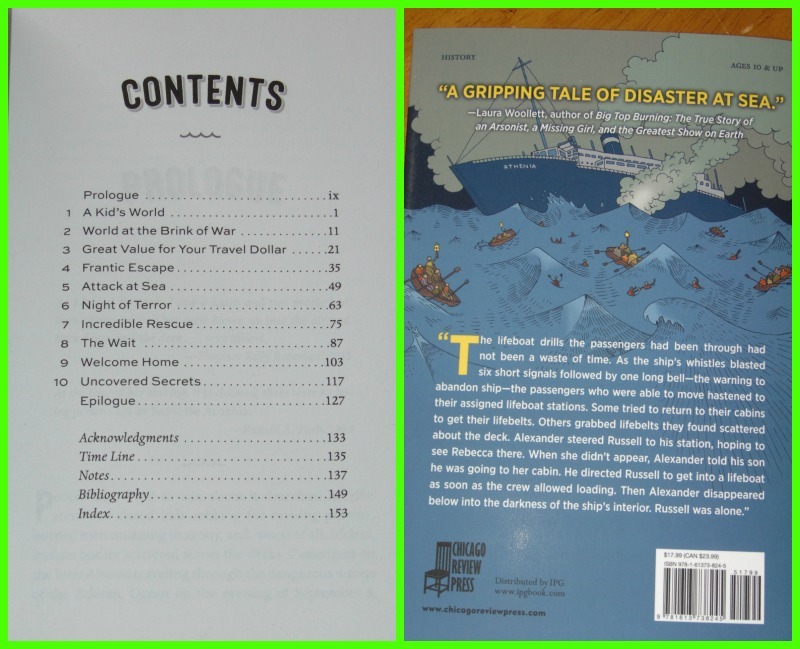 In the beginning of the book we get the table of contents, along with a map showing the points of interest. We get to watch a fish feeding, learn about earthquakes, visit Robot world, see the cars of the future and go to the theatre. All the major points of interest are highlighted to give you a well rounded view of the city. In the process of visiting these points of interest we are also introduced to Japanese culture (such as it’s polite to talk quietly in public and one doesn’t express feelings of emotion in public). The fun of the kite festivals and so much more. As you can see, the pages are in full colour, with a mixture of photos and drawings. The image of the Robot Park made me want to go visit it. Would be fun to see it you know? The reader is taken down into the fabric district, the traditional food streets, and all the places dedicated to animals. 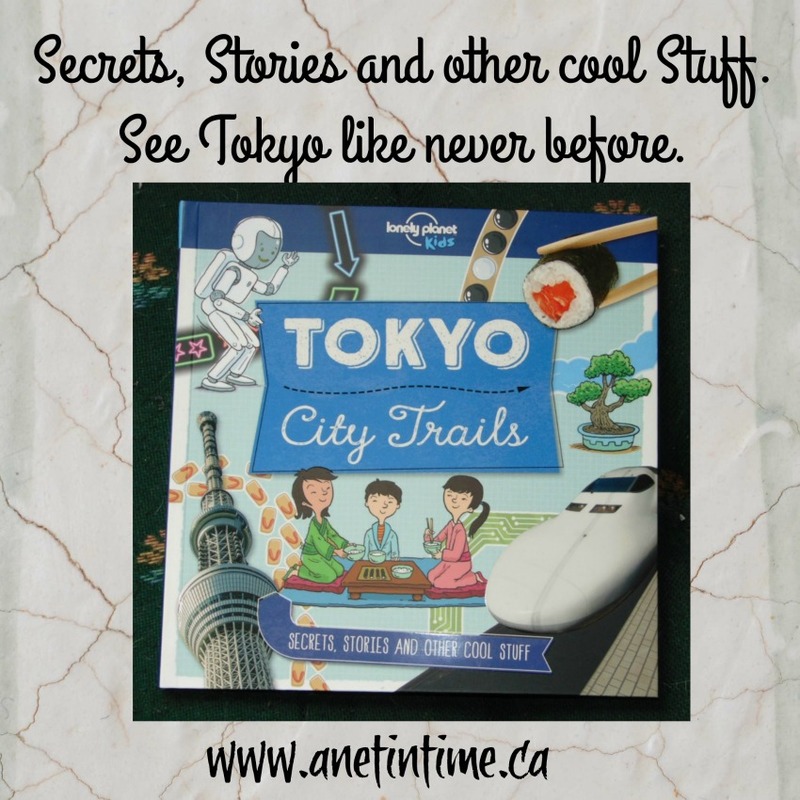 I thoroughly enjoyed this book, it showed me parts of Tokyo I hadn’t even considered. Who would think of a museum dedicated to parasites? Or learning what traditional Japanese underwear was? 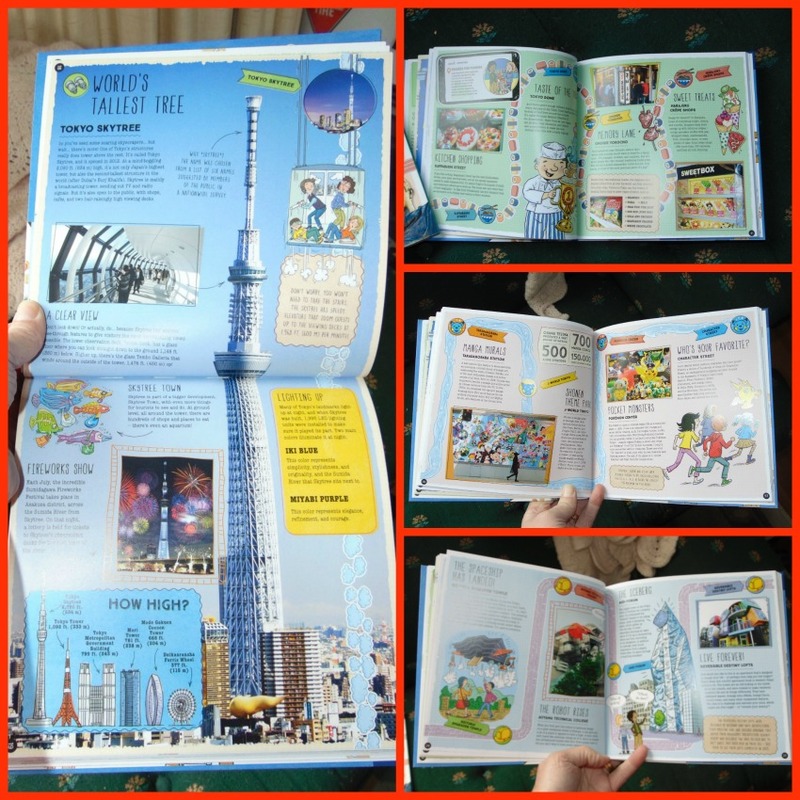 It was just filled with interesting tidbits about the city and the Japanese culture. Just a fun book. Made me want to go visit Tokyo so I could see all these sights for myself.. perhaps one day. 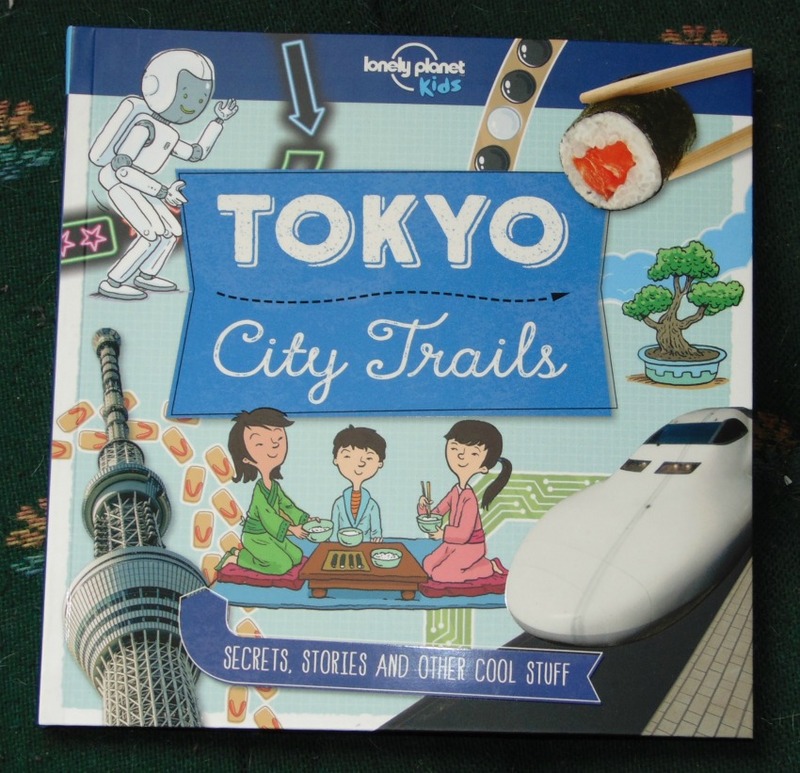 🙂 This would be a great book to hand to an upper elementary to middle school student if you are doing a country study, or wanting to visit Japan. They could easily pick a few items out that they wanted to know more about. Where to purchase? Amazon Link. 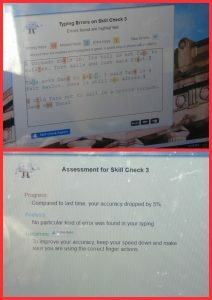 Last year my son used a typing program, he worked with it on the desktop we have upstairs and overall it went well, but he still struggled with his keyboarding skills. When the option came to try out Ultrakey, by Bytes of Learning, my son was rather excited! “MOM! 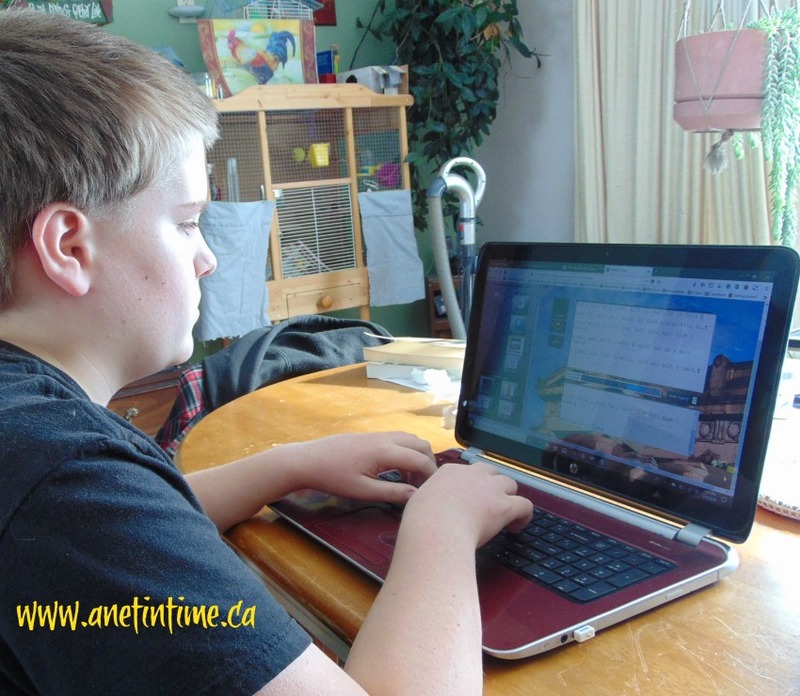 Will it help me type better?” I said “we can always try it out and see lad.” I invite you to come with me and see how the UltraKey Online Family Subscription can be as successful for your students. I’m trying to think where to start, I honestly haven’t needed to use this program at all. I got my lad set up and have talked with him as he problem solves or tries to figure out how quickly he should do lessons and practices, but overall my lad has taken ownership of Ultrakey. They set it up so each user can arrange the program the way they like it. You can change the background, voice, speed, accuracy and so forth. My lad didn’t care what the voice sounded like, but perferred the building as a background. I initially walked my son through the set up, helping him see how the program worked, setting up his preferences and just letting him run with it. The interface is easy to use. You will find this screen on every page, helping you quickly move from one section to another. The skill check is separate from the lessons, allowing one to redo a lesson, or redo a skill check without having to do both if you don’t wish to. The typing forum allows you to take practice tests that are timed as well as more official tests. My son hasn’t quite reached the skill level needed to do these yet. He’s been repeating the skill checks until he feels confident in moving forward. The lessons are in an easy to read font as well have having a voice over. The keyboard clearly shows where each letter is during the lessons. Occasionally I would ask my son to show me how he was doing, we’d get screens like the one below. you could check to see what you missed, and then the program would tell you if you had improved or not. I can’t say my lad is delighted at how slowly he is going through the course…but I’ve told him if he wants to improve he needs to spend longer than 10 minutes per day practicing, that I used to take typing classes for a whole hour! Oh my.. he was so startled when I told him that. He’s happy practicing for 10-20 minutes max per day and progressing slower. 🙂 I am seeing improvement now that he is not racing through the course. He’s taking his time practicing and learning where the keys are. I know in time he will be a proficient typist. The lessons are straight-forward, and they give you lots of time to practice over and over again. 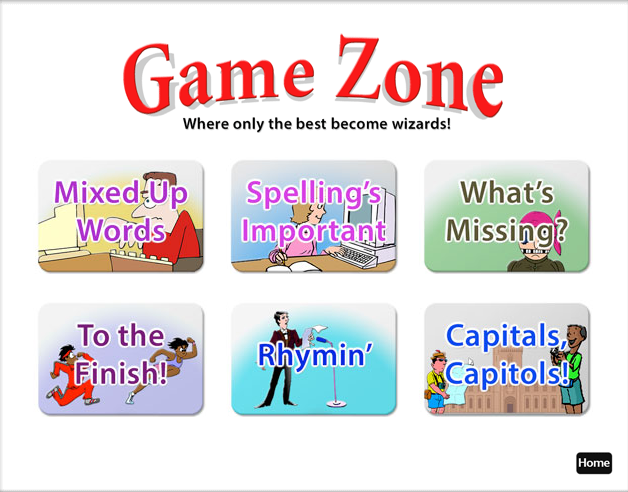 Along with games to help you practice the skills you are learning. The skill tests have options so you can change what you are practicing or can pick the one that you are most interested in. They have tests you can take when you are ready to do so. You aren’t forced to do anything in a particular order. It has everything in it that my son wants to help him to improve his keyboarding skills. Their media-rich instruction make this an enjoyable program to use. "Yay! I just beat mom's score. Look mom! I'm faster and better than you!" "I like that I can practice as much as I want to!" "I can do the skill checks over and over again". 1. The spacebar randomly stopped working during a skill test. This is where I discovered how wonderful their customer service was. I mentioned it to them and they immediately connected with me. Putting me in on a conference call so we could work through what the problem was. GREAT Customer Service. We figured out it was just a random glitch and it hasn’t happened again. 2. Skill test: They used capital letters leaving my son feeling flummoxed. How does one type a capital letter properly? “Mom, they didn’t teach me how to do that yet!” It was a great time for me to teach him how to do that. 🙂 It’s just something to be aware of. It was just a step missed. 3. Games and The Test Forum are not done according to the progress of the student. This means if they play games or do the formal tests they will run into letters they haven’t been taught yet (if they haven’t finished the program). 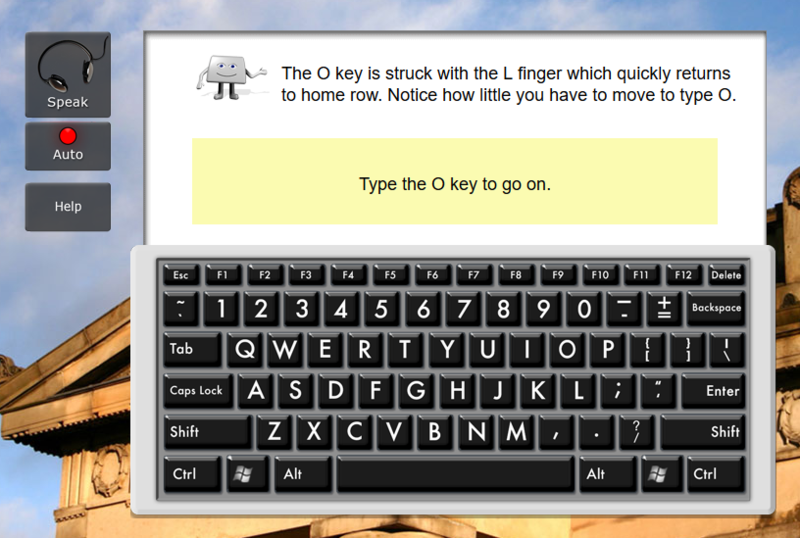 Bytes of Learning has done a wonderful job of putting UltraKey together. They have worked hard to make their success-based learning program as accessible as possible. The finer details of their efforts is what sets it apart. Their excellent customer service is just icing on the cake. The fact that It focuses on teaching typing skills and isn’t child focused appeals to him. Pricing: Depends on package Click Here. 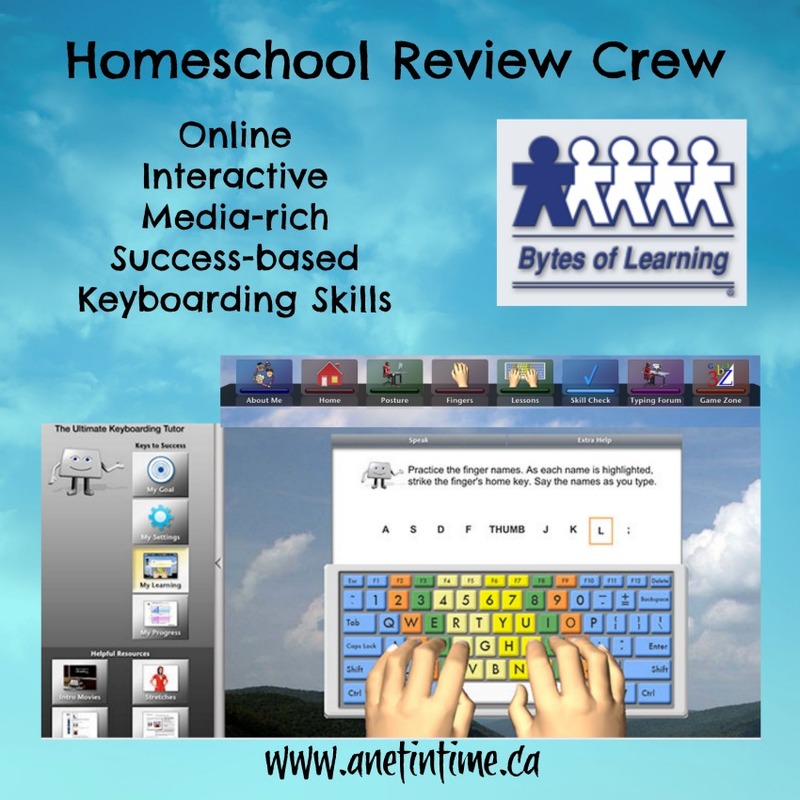 Visit the other members of the crew who reviewed Bytes of Learning by CLICKING HERE. Bytes of Learning can be found on Facebook. I don’t know about you, but I have a lad who is fascinated by a variety of animals and insects. He enjoys focusing on different how they are the same but different. How sometimes what they do relates to what people can do, and how they can often do it better than we can. 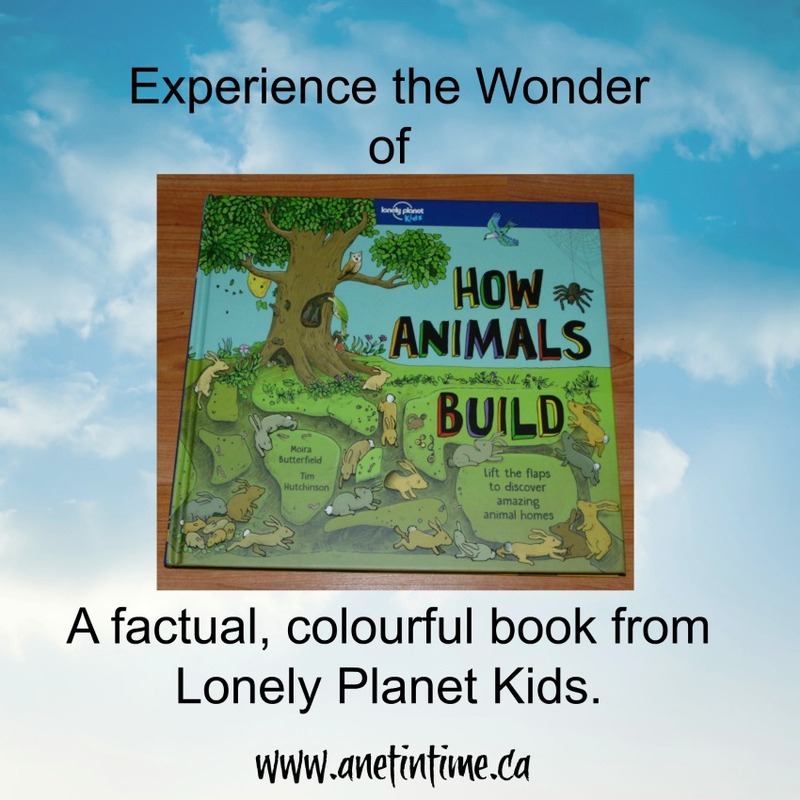 A book like “How Animals Build” is a book that appeals to him. Burrows, tunnels, nests, towns and much more. Come learn with us won’t you? 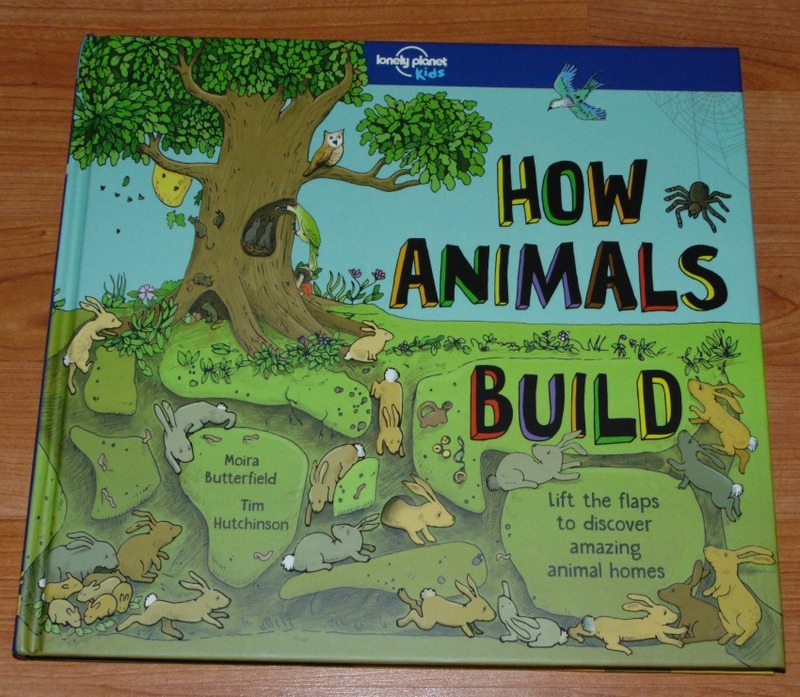 Lonely Planet Kids brings us another fascinating book to read, How Animals Build. Within the pages of this delightful read you will see termites town, penguin rock nests. bee hives, birds weaving nests and bowers, seeing fish living in rocks, bears hiding in ice packs, and beavers living in a lodge. So many different animals, and so many different ways to build. 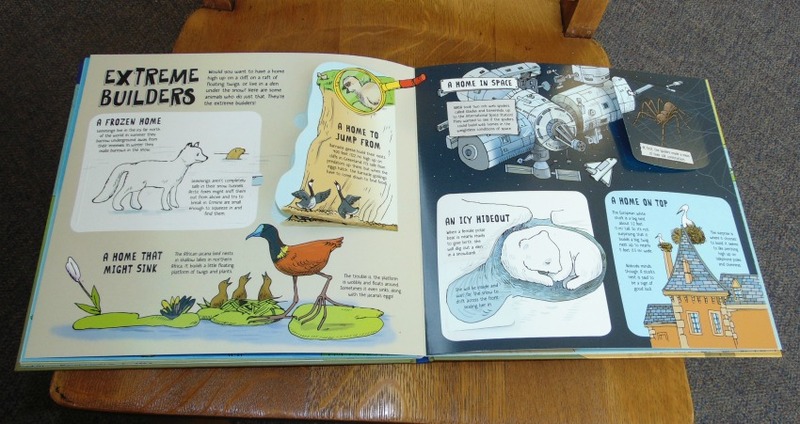 I loved the illustrations contained within the pages, bright and colourful, reflecting well the variety of colour found within the animal kingdom. I loved the fold out pages and the lift the flap elements. It’s just a lovely way to cram more information into a book in an interactive manner that helps the reader retain the information. This is a book you can go through several times, being amazed at the variety in the animals around us. Did you know that a spider went into space and learned to adapt to lack of gravity?! We were both surprised. You can find a video showing the web creation here. I thought the book was well done, but felt that they missed a crucial couple of groups: the sheer variety of insect and spider nests, and reptiles were scarcely covered. My son had hoped to see crocodile mounds, and bees that nest in hollow tubes, and spider webs of a variety of sorts. He was impressed with the variety of animals nests that were included and we even looked up the inside a termite town. The rest of the book, with it’s fold out pages and lift the flap elements was fantastic. Brightly coloured pages that were loaded with facts. We both learned much! Which is an excellent thing to do eh? Leaf rollers “I’ve seen those before mom!” The bunny tunnels “They do a lot of damage in towns don’t they mom?” The beehives brought back memories of going to Clovermead and seeing the bees in action. Just a thoroughly interesting book with lots of talking points. Well done. Animals, activity book, elementary, animal homes. 12 pages (plus fold outs), 8-12 years. When I received the NKJV Unaplogetic Study Bible I said to my hubby, “Wow, isn’t this a beautiful bible?” It’s simply is a beautiful bible, not only the cover, but how it is designed to help people know God better. Isn’t that the point of a study bible? To help people know God more? The goal of this bible is to inspire Christ-like thought, belief, speech and action. This red-letter bible has a number of various useful features, the predominant feature being the various notes found within the pages. 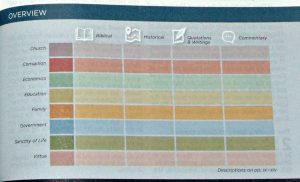 Most Study Bibles that I have used with have historical background, and explanatory text on the bottom half of the page. 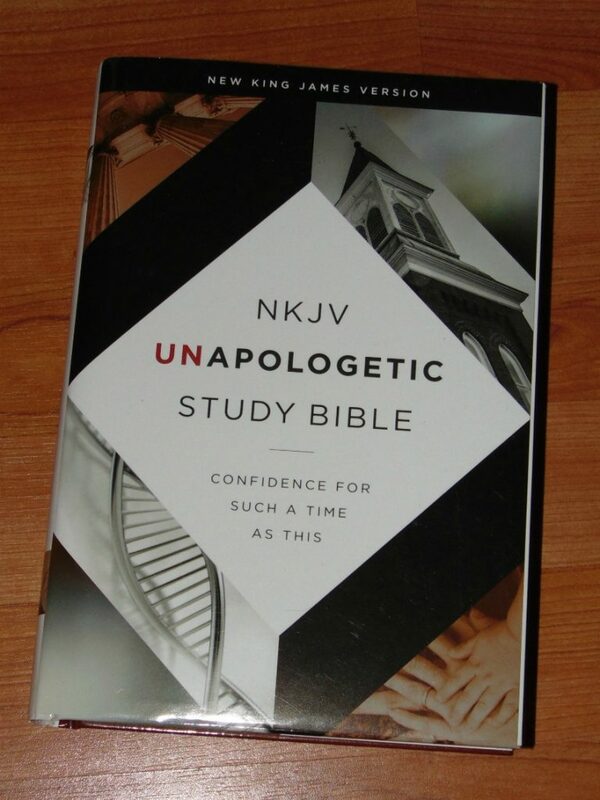 The NKJV Unapologetic Study Bible takes a somewhat different approach. They use notes and articles found from the Kairos Journal to deepen the understanding of the bible. These historical to present day articles delve into topics in a way that a normal study bible cannot. This means that when you are reading the bible, you are predominately READING the bible, and not a bunch of helpful little notes at the bottom of each page. This bible is not the same as most study bibles. 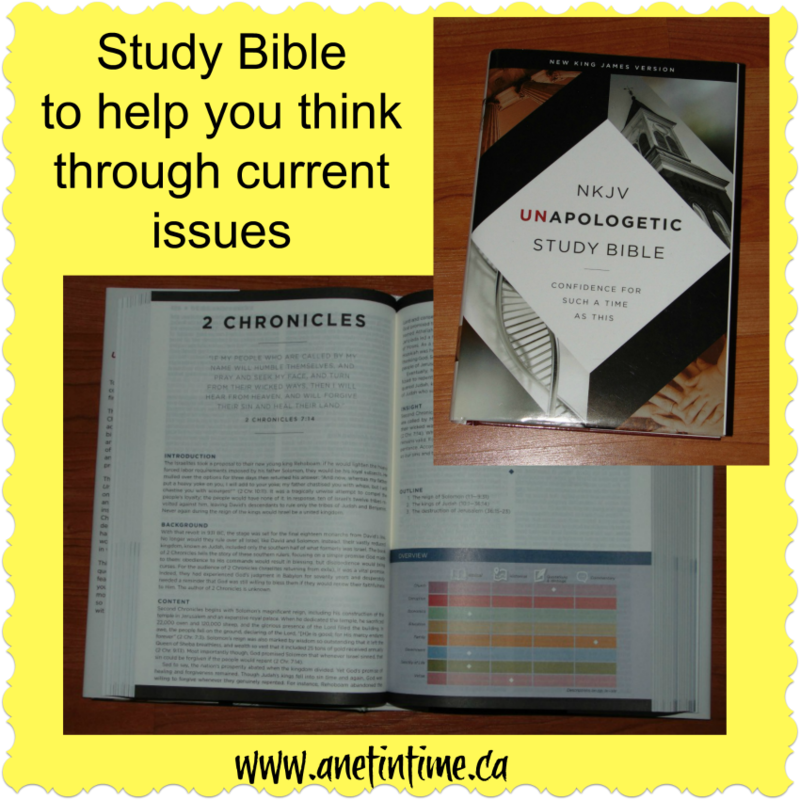 You need to understand the study bible wants to help you think through issues that we need to consider now-a-days, and does this through the use of well written articles, interspersed throughout the pages. These articles are divided into 8 categories: Church, corruption, Economics, Education, Family, Government, Sanctity of Life and Virtue. Each section is colour coded. A image like the one below is found on the opening page of each book. A white star in the block under each type of article you can find showing you if an article is found in that book of the bible. The articles found come from biblical, historical, Quotations/Writings and Commentary. 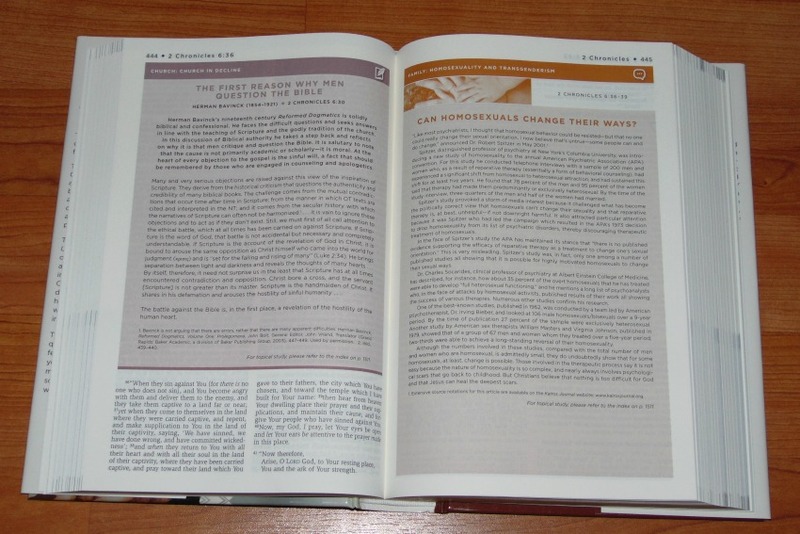 Each book of the bible has an introductory page, on which the book is introduced. The background, content, insight, and a brief outline is given. A central verse is highlighted. 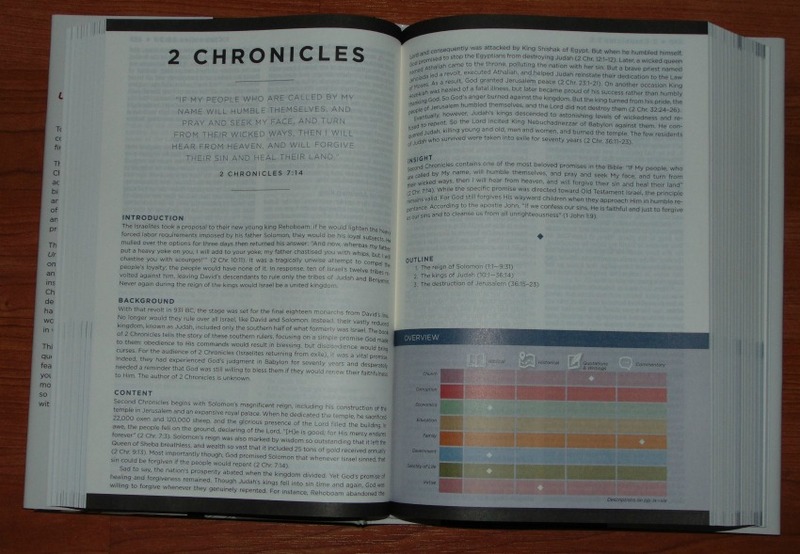 As you could see from the image below, 2 Chronicles has 6 articles placed in it. The articles included vary in length, most are one page long but some go a bit longer. You can find the articles referenced at the end of the bible. I did not read every article presented, but the ones I did were well-written and thought-provoking. I did not find anything that set off any alarm bells. You will find over 200 articles, 70 historical quotations and 50 profiles of historical figures. There are two indexes: canonical and topical. This is a bible for pastors and individuals who want to deepen their understanding of God’s word and his standard for living. The articles presented are biblical and further the understanding of who God is and his call upon our lives. I was delighted to be introduced to the Kairos Journal and wish I were a pastor so I could fully utilize it. 🙂 Some of the articles on this site are public, so I urge you to visit it, if only to get your brain thinking on various topics. 🙂 Would I use this bible? It’s a hard one to answer. If I wanted a hard copy of a bible, this would be one I would use. I liked the articles I read. I didn’t find them detracting or distracting God’s word, but rather giving me insight which helped me think more deeply. I love my online bible though… and would be hard pressed to give it up. 🙂 This NKJV Bible though… it’s a good one and worth keeping. Sometimes, in the course of a war, events happen that have repercussions unexpected. Torpedoed! tells us of one such event, the sinking of the Athenia. 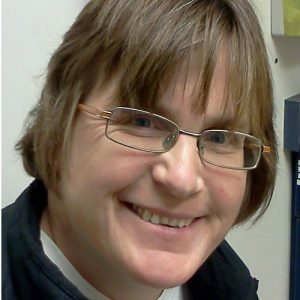 Cheryl Mullenbach, pulls out two children in this sad tale, to bring this story to life for middle school students. 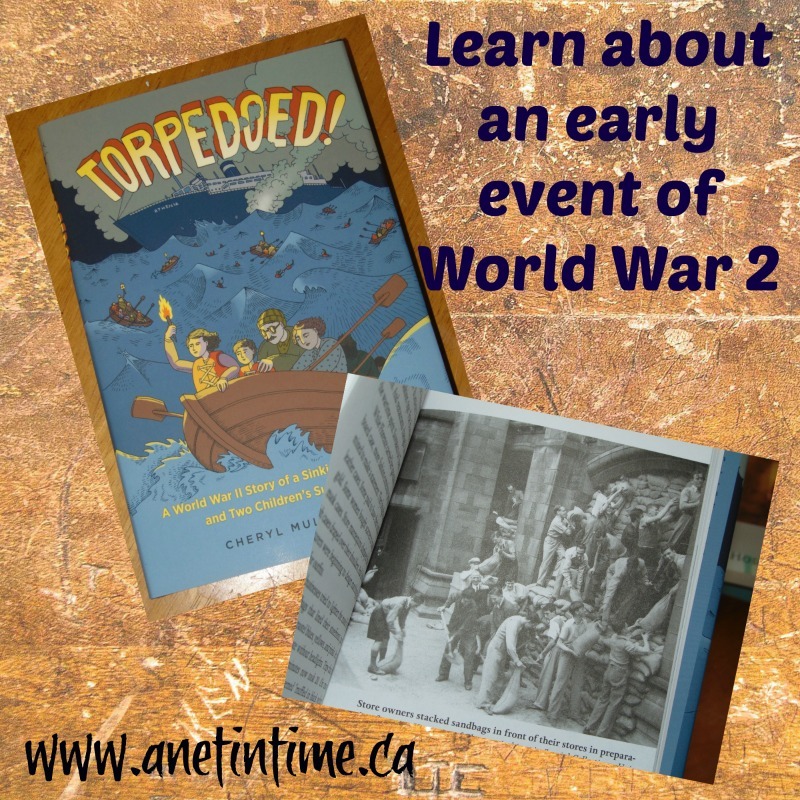 This is a World War II story of a Sinking Passenger Ship and Two Children’s Survival at Sea. Until I read this book I was unfamiliar with this story, and this book spurred on my curiousity to know, sending me to youtube. There weren’t a lot of videos about the Athenia, it is an easily forgotten bit of history, what with Germany invading Poland around the same time. Ms. Mullenbach, doesn’t tell a story as she writes this book, it reads like a text. She didn’t make up a fictionalized story to compell you to read the story, but she grabs hold of two children to help personalize the text that she imparts. Walking through the days with Florence (age 14) and Russell (age 11) does a great job of helping us to see how the war affected the lives of innocents. 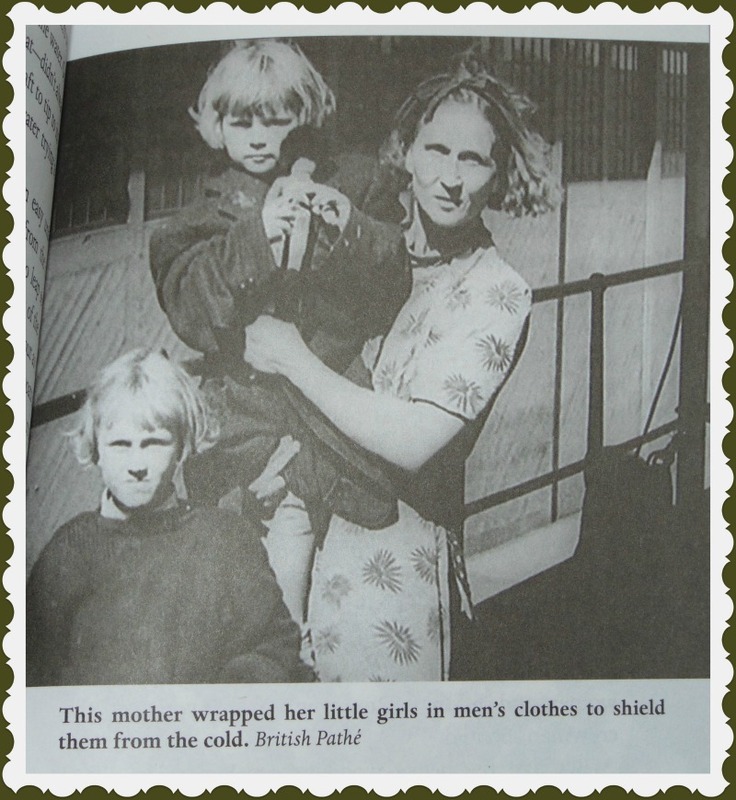 We were able to see how the war caused unexpected disruption and hurt families. Images dot the pages from back in the day, bringing to the life the reality of what these individuals needed to deal with. I appreciate the time that Ms. Mullenbach took to organize this book in a logical manner. Walking us through the planning, the travel and the thought processes. She closes off with a good bibliography complete with time line. I have to admit, this book was different than I expected, and that’s not a bad thing. I fully expected a fictionalized account, a story, not a middle school textbook. It was a good read that I suspect your students would enjoy reading. This is a concisely written factual book that shows the repercussions … in the immediate (the sinking of the ship, the loss of lives) and in the Long-term (Nuremberg trials). 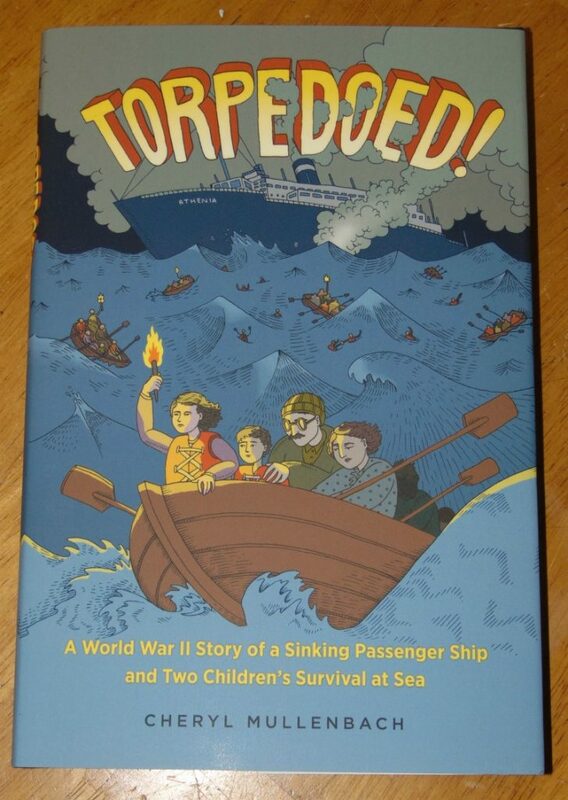 Torpedoed is written at a middle school level without a lot of extra drama. It would be an excellent book to start off a study of World War II. The graphics that fill the pages helped to round out the story and showed well what things were like during the War. Good book. and Two Children's Survival at Sea. Where to find it? Amazon link. Other books on the wars that I’ve reviewed? We will not be silent. Prisoner of Dieppe. Once was a time. So I’ve reviewed Lesson Planning for Highschool, and Moving with Words and Actions, today I have for you the middle school version. 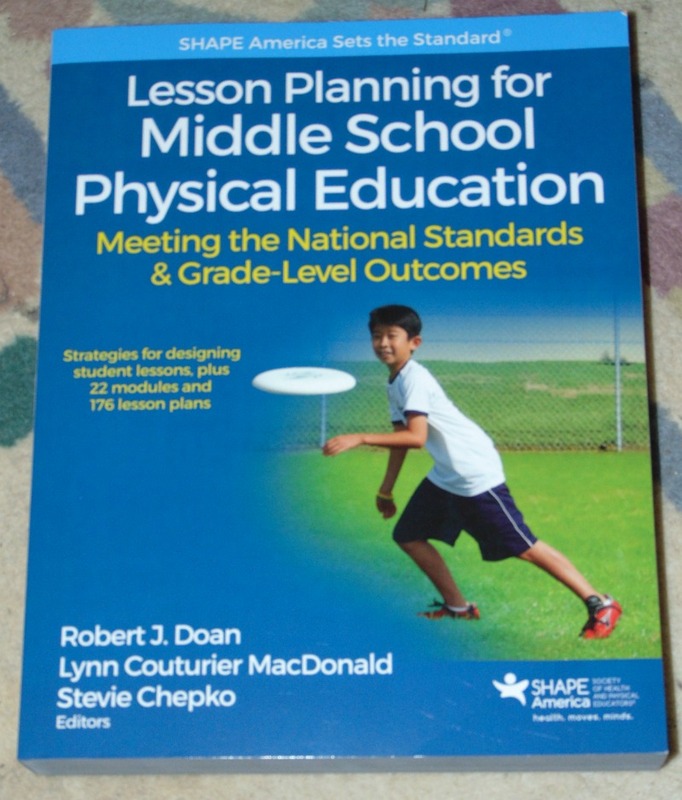 Lesson Planning for Middle School Physical Education is a great book for the teacher of middle school physical education, covering the gambit of the what and why, to the how and where. Filled with instructional tasks, and the break down of a variety of middle school physical activities, to make teaching easier and in line with the national standards. Shape American, along with Human Kinetics, has come out with a thorough treatise on teaching middle school students their physical education requirements. 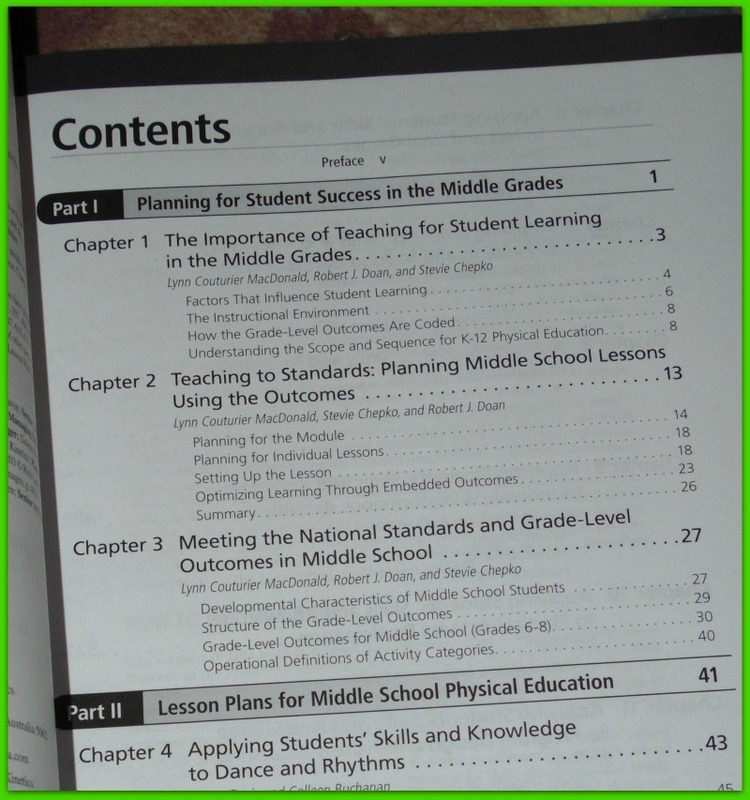 Lesson Planning for Middle School Physical Education is a 778 page well written manual on teaching physical education to your middle school students. 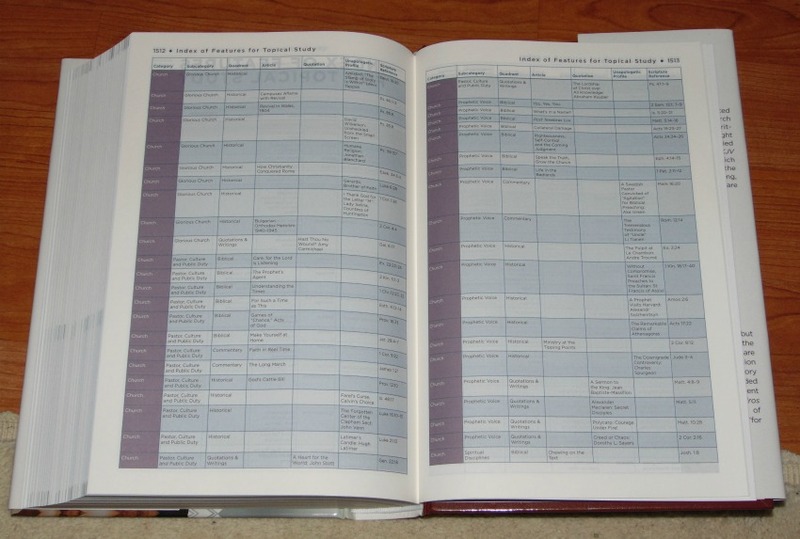 It is broken down into 11 chapters divided into two sections. 1. Planning to Student Success in the Middle Grades. + The Importance of Teaching for Student Learning in the Middle Grades. + Meeting the National Standards and Grade-Level Outcomes in Middle School. I like how even in middle school we are encouraged to help our students plan out their physical education even outside the classroom. Isn’t it great when they want to be involved with something? I look at my lad and his interest in Karate. This is Shape America is all about… helping our youth make wise decisions. They start in the classroom with the encouragement to take it beyond the doors. Ergo introducing a wide level of sports/physical fitness options that you might not have considered before. Such as dance, handball, something called ultimate .. where the student needs to show proficiency in a wide range of activities: catching, throwing, defense and more, learning disc golf, in-line skating, biking, backpacking and more just to name a few. I have to admit, as I read through the list I wondered… where is ice skating? I suppose though it would be impossible to list every activity that youth can engage in (as they don’t have karate either). Each lesson accredits the teacher who designed the program, as I looked through, they came from all areas of the United States. 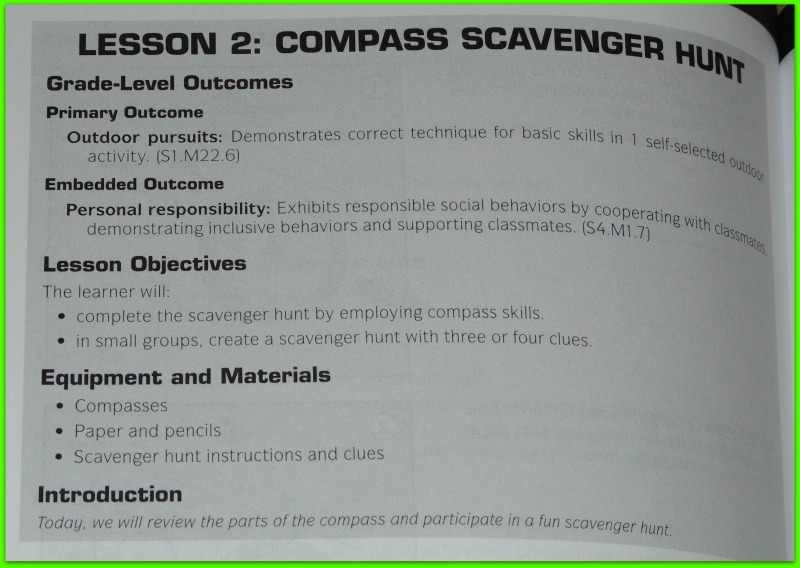 Each lesson has a number of tasks it is broken down into. For instance, Pickleball as 8 separate tasks from how to hit the ball, learning game play, playing with a partner and more. The authors have endeavored to make this treatise and ready to use as they can. 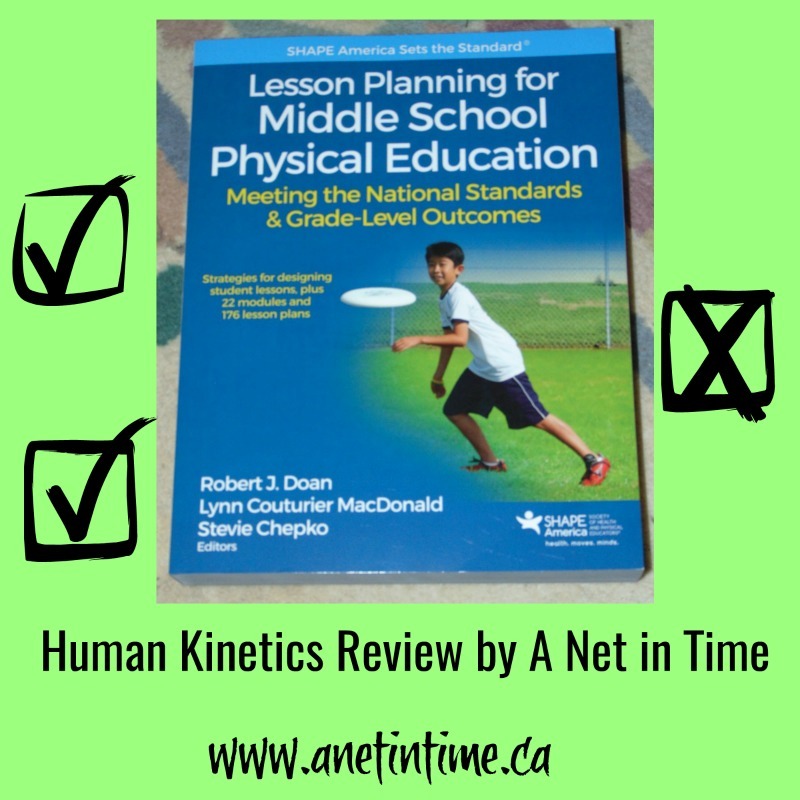 A great resource for the physical education teacher of middle school. Broken down into different grade levels this is a wonderful aid to helping your students learn some of the many ways that physical education can take place. I love how each lesson is broken down into smaller tasks to ensure the sport is taught well. - Meeting the National Standards & Grade-level Outcomes.